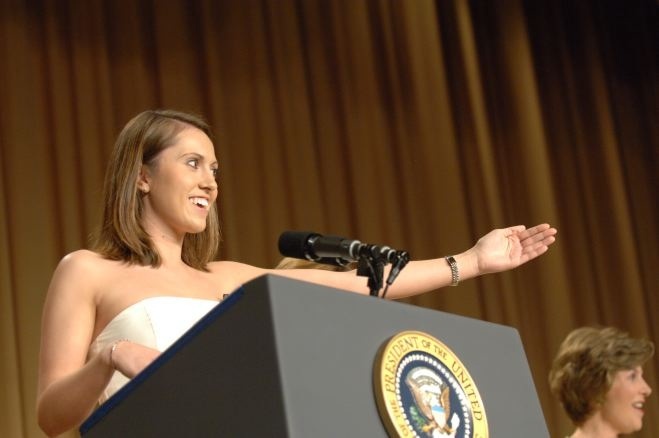 Solemnity mixed with laughter at the 2007 White House Correspondents’ Association dinner. 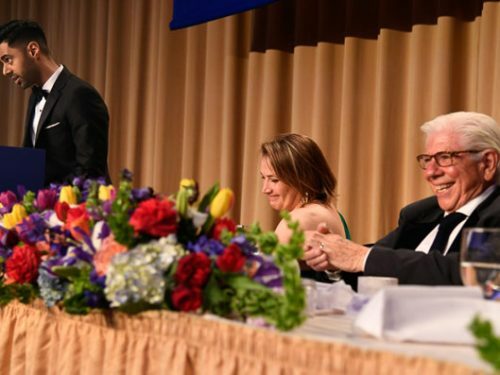 Less than a week after the April 16 shooting at Virginia Polytechnic Institute, the estimated 3,000 dinner attendees tried to find a balance of cheer, stargazing and respect for the tragedy. 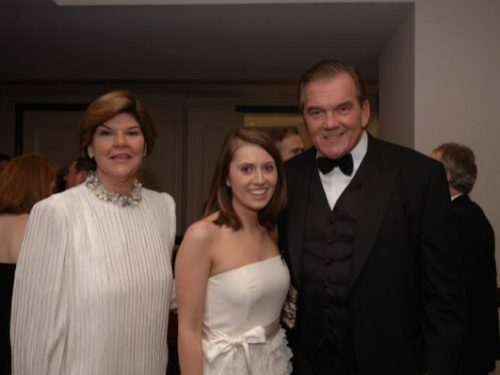 The dinner honored Amie Steele, editor of Virginia Tech’s school paper that continued to update and put out information even as the shooting unfolded on the campus. The editor led a rousing cheer of “Let’s go Hokies” that everyone shouted with enthusiasm. Steele said afterward that being invited to the dinner meant a lot to her and the school. “It’s been absolutely amazing,” she said. “It’s been a tough week trying to represent the student body,” and she said she hoped that she had done her fellow students justice. 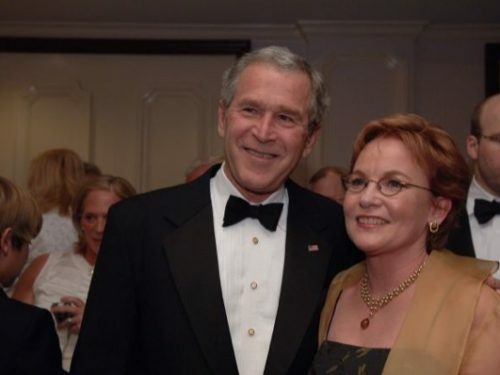 The audience got more than a few laughs at the president’s expense when a video of “Top Ten George W. Bush Moments” from David Letterman was shown. 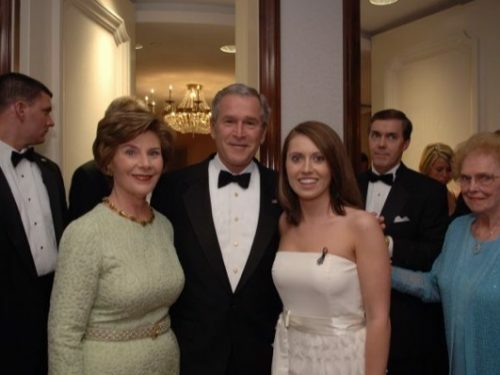 Laughter erupted particularly at TV clips of Bush attempting to leave a news conference through locked doors and a camera that caught him spitting as he crossed the White House lawn. 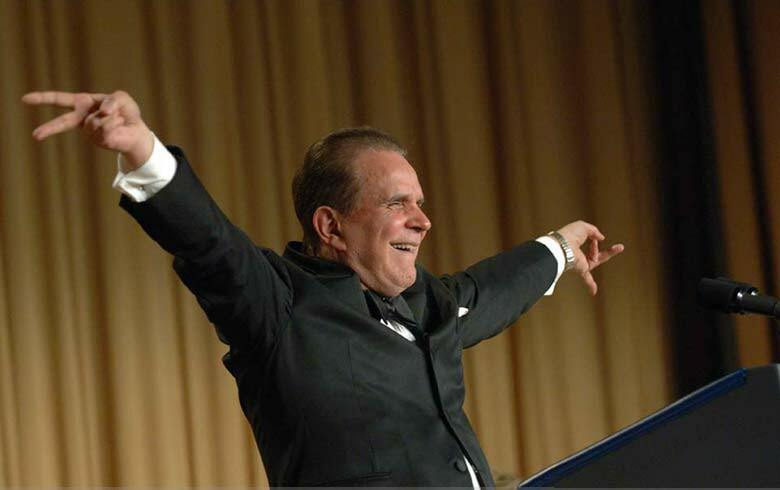 Rich Little, a comedian who rose to fame in the 1970s with his Richard Nixon impression, had the tough task of bringing levity to the proceeding with impersonations of presidents, celebrities and politicians. 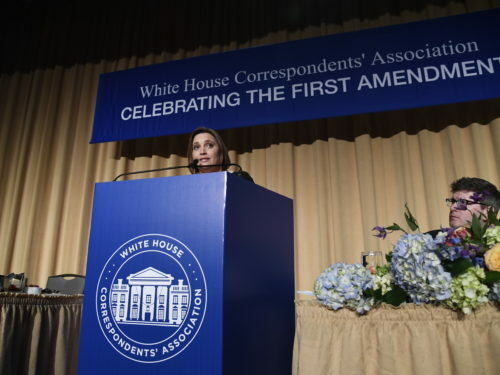 Little succeeded in bringing the house some good, wholesome laughs, according to Bob Schieffer of CBS. 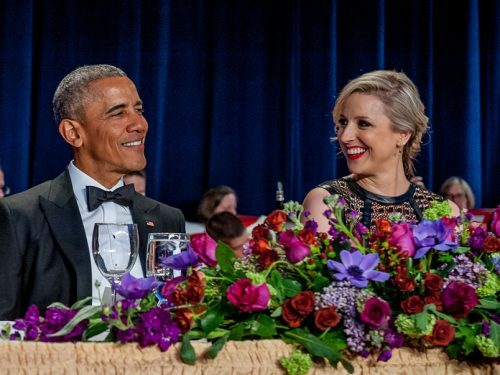 He had been skeptical anyone could top Steve Bridges, who brought the house down at last year’s dinner with his dead on impersonation of the president. Of course, nothing could stop the other sport of the evening: stargazing. This year’s celebrity du jour was Sanjaya Malakar, the American Idol contestant with lovely locks. His schedule suddenly opened up after he got voted off of the show earlier in the week. His Shirley Temple curls did not disappoint his fans, who flocked around him to score a picture with the singer. 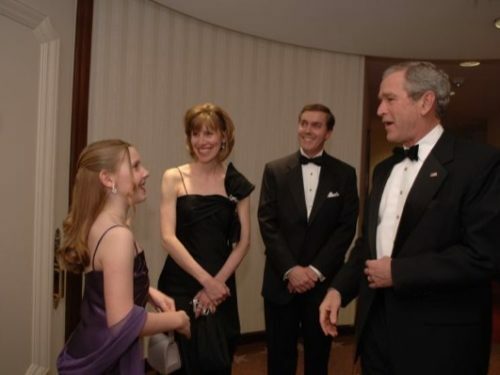 Unfortunately many were rebuffed by the eight-person detail surrounding the celebrity. 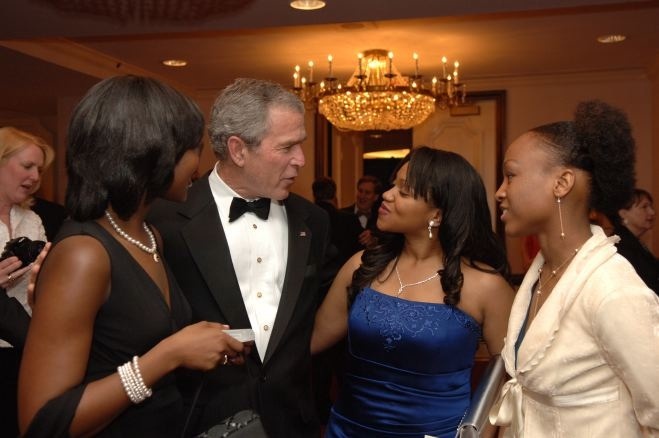 President Bush visits with WHCA scholarship recipients at the 2007 dinner. 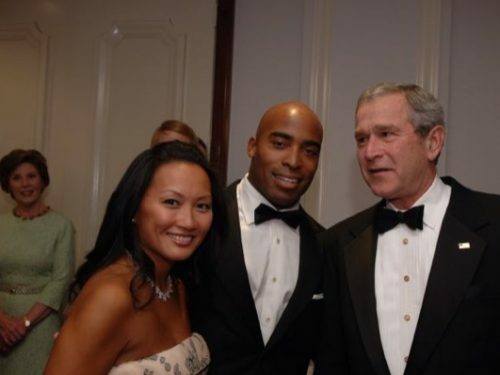 Sporting less security, other notable celebrities who attended were Olympic figure skater Michelle Kwan, Academy Award winner Jane Fonda, New York Mayor Michael Bloomberg, former New York mayor and current GOP presidential aspirant Rudy Giuliani, Teri Hatcher of ABC’s Desperate Housewives, HBO’s Bill Paxton of Big Love, and Larry David of Curb Your Enthusiasm. 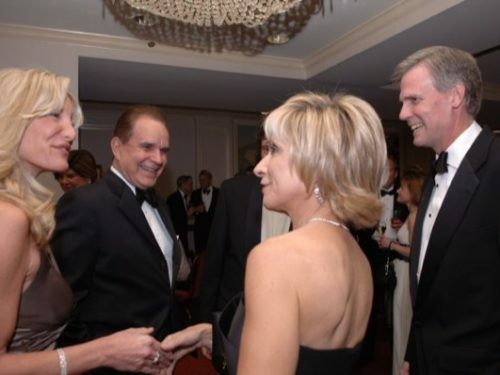 And in the spirit of the evening’s goal of putting politics and agendas aside, TV newsmen George Stephanopoulus and Charlie Gibson didn’t seem to mind that their presence on either side of her didn’t merit any mention by Rice.